What science says on Cosmological models on the origin and fate of the Universe? Evolution of cosmological models: Cosmology is the study of the universe. It deals with the origin, evolution and fate of the universe. Over centuries, some of the brilliant minds of Philosophers and scientists have tried to develop an understanding of just what the universe is and where it came from, suggesting in the process a bewildering variety of theories and ideas, through various models. However, the most popular and accepted model of the universe, since 1687 to early 20th century, was “the Static Universe” as proposed by Sir Issac Newton in his book “Principia”. The Static Universe is a cosmological model in which the universe is both spatially infinite and temporally infinite, and universe is static, neither expanding nor contracting. Such a universe does not have spatial curvature; that is to say that it is ‘flat’ or Euclidean. Surprisingly, in 1917 Albert Einstein while solving the equations of his revolutionary General Theory of Relativity (GTR) found that universe is expanding which is contrary to the most popular Static Model at that time! Thus, Einstein had a doubt on his results and did not believe results of his own equations because of the fear of the then scientific community who all were in favour of static universe model. Thus, he introduced a fudge factor called Cosmological Constant to counteract the expansion and concluded that Universe is Static and declared that his theory is in consistent with the Static Universe model. There comes Olber’s paradox which states that if the universe is eternal and infinite and if it has infinite number of stars, then the night should be bright. But, the night sky is always dark till today. Olber’s paradox literally proved static model of the universe incorrect and paved path for dynamic universe. In early 20th century AD, three profound theories on the origin of the universe were proposed by different scientists i.e. (i) Steady state theory, (ii) Big Bang theory, (iii) Oscillating (pulsating) universe theory. Steady state theory (flat model) was jointly proposed by Herman Bondi, Fred Hoyle and Thomas Gold, in 1928 and it states that the Universe is the same everywhere and for all time, both in the past and in the future, there is neither beginning nor end to the universe, and it has a constant mean density. Density of galaxies remains more or less constant as it expands (spaces filled in new galaxies). Big Bang theory (open model) was proposed in 1926 by Georges Lemaitre and coined by George Gamow. 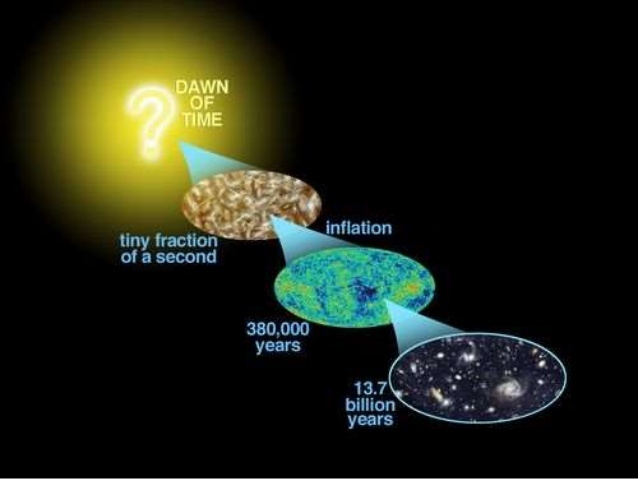 Big bang theory says that the universe began about 14 billion years ago from a huge explosion of YLEM and that gigantic explosion is termed as big bang and that moment gave birth to time, space, energy and matter in all directions. About 14 billion years ago, the entire universe was less than an atom, confined to a singularity point which was infinitesimally small, but infinitely hot and dense. In an instant, the universe expanded very quickly in all directions, and then it settled down to a slower rate of expansion, cooling all the time. After a few minutes it had cooled enough for protons to form. It took another 3, 80,000 years to cool enough for hydrogen and helium atoms to form. This allowed light to shine through about 380,000 years after the Big Bang. This early light-sometimes called the “afterglow” of the Big Bang-is more properly known as the cosmic microwave background radiation (CMBR). And subsequently, after 13.8 billion years after Big Bang moment, present universe consisting of large number of galaxies was formed. Density of galaxies falls as universe expands according to big bang model. The oscillating universe theory (closed model), proposed by Fred Hoyle, believes that the universe began in a giant explosion and is expanding. It states that the universe will continue to expand until the maximum and will then collapse on itself until it comes together in a big “crunch”. In the oscillating universe theory, this cycle would continue indefinitely. 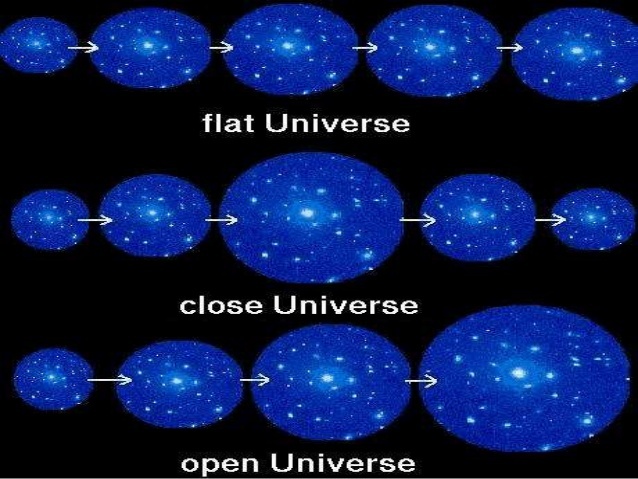 The steady state theory depicts a flat universe as fate of the universe, whereas Big bang theory and Oscillating universe predict Open Universe and Close universe as the fate of the universe. Birth of Expanding Universe: 12 years later after 1917 when Einstein managed to cheat his equations, in 1929, the American astronomer Edwin Hubble stunned the scientific community by announcing a dramatic discovery that Universe is expanding, but not static. Hubble found that the light coming from the galaxies was shifted towards the red end of the spectrum due to the Doppler effect (known as “redshift”), which indicated that the galaxies were moving away from us. Hubble showed that, in our expanding universe, every galaxy is receding away from us with a speed (V) which is in direct proportion to its distance (D), known as Hubble’s Law (V=HD), where H is Hubble’s constant, inverse of which gives the age of the universe (~13.8 billion years). Thus, Hubble’s discovery led to abandon the Static Universe model, gave birth of Expanding Universe Model in 1929, and Einstein was also forced to remove his cosmological constant and to announce that introduction of Cosmological Constant as his “Biggest Blunder” he had ever made in his life. Thus, Einstein missed his second Nobel Prize in General Theory of Relativity (GTR) in his life otherwise he could have predicted expanding universe 12 years before Hubble and grabbed Nobel Prize. He landed up his Nobel Prize in Photoelectric Effect in 1921. Soon after the confirmation of expanding universe by Gravitational Redshift and Hubble’s findings (equations), scientist started working on the origin and fate of the universe. Now, the next immediate question is – how did universe begin? If the Universe is expanding, that suggests it used to be smaller and more compact. And if you go back far enough, then there was a moment in the past when all the matter in the Universe was packed into a point and exploded outwards. That moment was the Big Bang. If Big bang really happened, we would be really able to see the remnants of the afterglow of the big bang (CMBR) which was predicted by Ralph Alpher and other scientists in 1948. After the Big Bang, the whole Universe was flooded with incredibly bright light. As the Universe has expanded, that light has been stretched so that it is now microwaves. A microwave telescope can see this ancient light from the very beginning of the Universe. In fact, a view through a microwave telescope shows the whole sky filled with a glow, day and night. Unlike light coming from a star, it is the same wherever you look, and wherever you are. This glow is called the Cosmic Microwave Background radiation (CMBR). CMBR was found only by accident almost 20 years later its prediction, by Arno Penzias and Robert Wilson, both of Bell Telephone Laboratories in Murray Hill, New Jersey, were building a radio receiver in 1965 and begged 1978 physics Nobel Prize for their discovery. The Nobel Prize in Physics 2006 was awarded jointly to John C. Mather and George F. Smoot “for their discovery of the blackbody form and anisotropy of the cosmic microwave background radiation (CMBR).” The cosmic microwave background has been observed on many missions. One of the most famous space-faring missions was NASA’s Cosmic Background Explorer (COBE) satellite, which mapped the sky in the 1990s. 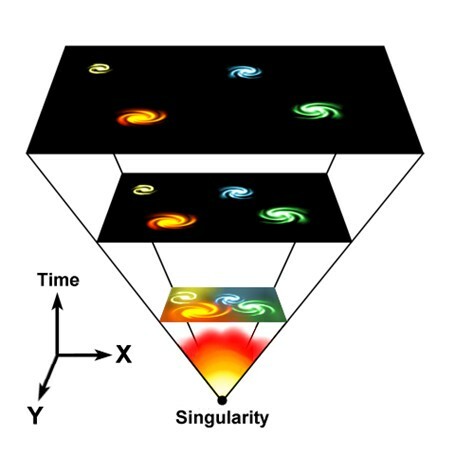 Thus, expanding universe model is experimentally confirmed and Big Bang theory is also confirmed by experimental findings on the remnant signatures of big bang event. Today, expanding universe and big bang is the most accepted and undisputed theory of the universe. Deciphering the age-old mythological tale! In the tale-“thaina soraren atiyasi yamna nemlammee – Once upon a time, the sky was extremely low…” means “once upon a time, radius of the universe was very small, universe was very tiny, it depicts about the early or near to big bang event…”. 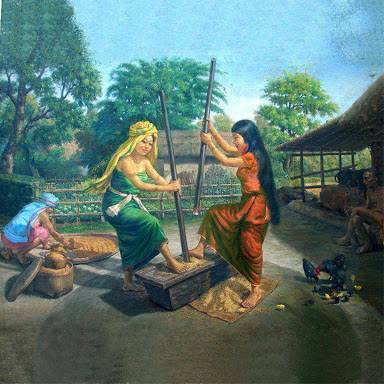 “… fou subada sukna thenglammee – the pestle was also touching the sky…” symbolizes about the “infinitesimally small universe or big bang singularity…(Big Bang Model)”. “…atiyasi sukna khangsu sugatkhi – the pestle pushed the sky up suddenly…” means “…sudden explosion (big bang moment – khangsu sugatpa) has happened and the radius of the universe rapidly increases which also means that the universe got expanded suddenly due a mysterious type internal force (push)… (Expanding Universe Model)” “….adudagi adum atiyasi sum sum wangkhatkhi – then, the sky went up far and high since then……” means “…the universe is expanding since then (big bang event) and is continuing its expansion…(depiction of Open Universe model as fate of the universe)”. *Images credit goes to original sites. I would like to convey this is Truly a useful and a real safe of our indigeneous tales and for knowledges too. Superbly explain n correlate the mythological tales of Manipur with Science. Great work !!! Your contribution made us eagerness to know more about the mysterious of our culture and philosophical thoughts flourished from the immortal times of our Unique civilization. Hope more of such contribution from you in future to input in our scanty manuscript n archaeological findings. Thank you so much brother for sharing and explanation such a precious story to the world which is related to our forefathers. We should not forget that we are the sons & daughters of those brave forefathers and let’s follow their footpath. 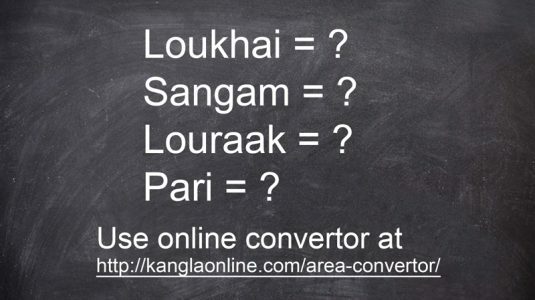 Sanayai Khuman. Now there reveals the moral of the folk story..
From today, whenever i tell this story to any child, i will give this moral” Universe is expanding” by sure. Even though Iam not an astrophysicist, sir u perturbed me to go through the world of Cosmology. Wonderful amalgamation of the compiled scientific facts with mythological thoughts of your local. These thoughts are purely imaginative but there shines your skill of linking them with the big bang everlasting universal expansion. The illustrative figures with scientific elaboration makes one to read the article at a stretch. Scientific temper with your local flavour of writing may bring many young into science stream. Kudos Mr Raghu. Very nice and interesting articles, solving many queries . Your articles are real eye-openers, particularly, in the context of Manipur regions and are worth reading even people outside Manipur. All your articles are very informative, illustrative, and will be really unforgettable by the people of Manipur. Keep going the spree…Good luck Raghu….. Very interesting article articulated well with facts and figures. Love reading it. Very interesting and meticulously interpreted. Thanks Dr Raghu for the trailing innovative ideas and articles, which will be reverted back and forth to the young minds of Manipur state…. Good job and proud of you…. Another eye-opener master piece from Dr. Raghu Ningthoujam ! Lots of profound knowledge knitted in-depth in the tale, we never thought of so and just let it passed from one ear to another ear…! Now, the Pandora’s box is open with your understanding of the riddle with unparalleled correlations and verdict is loud now ! proud of your effort and work…proud of our forefathers who had laid their souls for the sovereignty of the land & us, and carry forward such knowledge over ages despite being rooted up and turned the society upside down…God bless you Raghu and keep going…. Thanks you for decoding such valuable treasure for the mankind. May the SIDABA MAPU BLESS YOU. Great to see you again dear calssmate Dr. Raghu Ningthoujam. Such an interpretation can be done by those who keep in touch with indigenous culture and tradition to think with the natural environment. Great Idea to correlate with local tradition which shows some of physical activity of natural science.